Holy cow! Holy cow! HOLY COW! 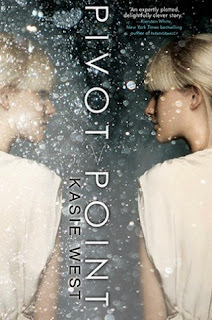 I bought Pivot Point to read it for a read-a-long with the Goodreads group I am a part of, Book BFF's. I honestly thought that I was going to hate it, or only kind of like it. I haven't read any time travel books, so I thought I wasn't going to get into it, but boy was I wrong! First let me start by saying reading this for a read-a-long was seriously the best way to read it. It made me love it that much more, because I was forced to only read a certain amount at a time. If you want to join the read-a-long group then click the link for it above and if you need any invite to join let me know and I will definitely invite you. I really wanted to keep reading more than I was supposed to for the week and I had to try with all my might to ignore the temptation. I think if I wouldn't have read this with my goodreads group that I either A. wouldn't have read it at all or B. would have read it in one sitting if I did pick it up on my own. Pivot Point is seriously imaginative. I never expected anything that happened to happen in this book. There was just so much creativity and ingeniousness on every freaking page. I don't know how Kasie West got the idea to write this book, but if I met her I would hug her and thank her a thousand times for it. I have never read a book like this and I am so thankful for it. This is definitely one of my all time favorite reads for not only the year, but ever. I think the thing that really got me was the paranormal aspect to it. I won't tell you what it is, because I want you to be pleasantly surprised as well, but it was fantastic. You know how I love alternating chapters and Pivot Point had them, but it was used in a totally unique way that I haven't seen done before. It made for a VERY interesting read and made me read faster so that I could get to the chapters I wanted to read. I usually don't care too much for a love triangle that goes on too long, but this book did it in a way where it had to go on for so long and I was ok with that. When I first started the book I was definitely all on board for one of the guys, but then after the second week of reading it I completely switched sides and never looked back. Now when I think about it I feel so guilty for not always being on the guy I ended up picking side in the first place. I was just so caught up with the paranormal aspect of this book that I was blind to him, but I ended up picking the right side in the end. I seriously cried over the ending. I could not believe the sacrifices that were made in this book. It is seriously the most amazing book I have read in a long time and just so freaking ingenious. I cannot wait for the sequel to come out. It is going to be AMAZING and I think there will still be alternating chapters and I think I know how Kasie is going to do it too. I just cannot believe I have to wait so long to read it. I might die before then, but I will try to hold on for its release. OUTSTANDING! Definitely my favorite book I have read this year and probably one of my all time favorites. I bought this book thinking that I wasn't going to like it very much and end up regretting spending money on it, but I am so happy I bought it because it is amazing. I never expected this book to be so ingenious. It is so imaginative and unique, and I have never read anything like it before. I highly suggest everyone to go and pick up this book, because you will NOT be disappointed.